This 4 hour clinic is designed to provide RunSmart sessions 1, 2, and 3 all on the same day. The RunSmart sessions are for anyone wanting to become a better runner and to prevent injury - regardless of skill, mileage, or running pace. 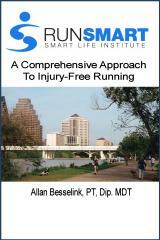 A special package rate includes a copy of the book "RunSmart: A Comprehensive Approach To Injury-Free Running". The cost of the camp is $60.00. Advance registration and payment ONLY - please register online or by phone and you will be contacted regarding payment options. Registration closes on 2/25/09 at 10:00 pm.